IT based risk management system (RMS) for export of Goods from India was launched today. Speaking on the occasion Finance Minister said that RMS is a trust based IT system that expects the trade to make correct declarations to Customs. It is a trade facilitation measure which, on implementation, would reduce dwell time from few days to few hours. In view of its obvious advantages, RMS is also being endorsed globally at all forums including WTO. Finance Minister also emphasized that success of any trade facilitation measure depends on compliance of legal requirements by trade. He urged the trade to comply with the legal provisions so that Customs can ensure speedy clearance of the import and export goods. The launch of RMS in exports today covers 11 Customs stations at Bangalore, Chennai, Delhi, Hyderabad, Mumbai, Pune and Tutocorin. It would be extended to all EDI Customs stations by year end. Benefits are expected to accrue to the trade in terms of faster clearances and reduced transaction costs thereby enhancing the global competitiveness of our export goods. Similar RMS is already there for import clearance of goods. For exports of goods, RMS was missing. This is a gap that needed to be filled. Kudos. Two points to be noted. One, RMS ensures that goods are randomly picked up by the computer software for physical inspection. The picking up is not totally random. It is based on certain criteria which assigns a risk weight leading to selection for inspection. For example, a new exporter might be picked up with higher probability for physical verification of goods; when compared to a regular exporter. Currently, goods are picked up for inspection based on assessing officer's wish, which is not very scientific (difficult to rule out gut feel, hence I can't call it unscientific). Two, RMS needs a huge database to operate. For example, for imports, the valuation of goods is picked up by RMS software based on all India level database. A significant deviation leads to re-valuation of goods or physical inspection. Overall, RMS makes clearance of export goods faster and more scientific. 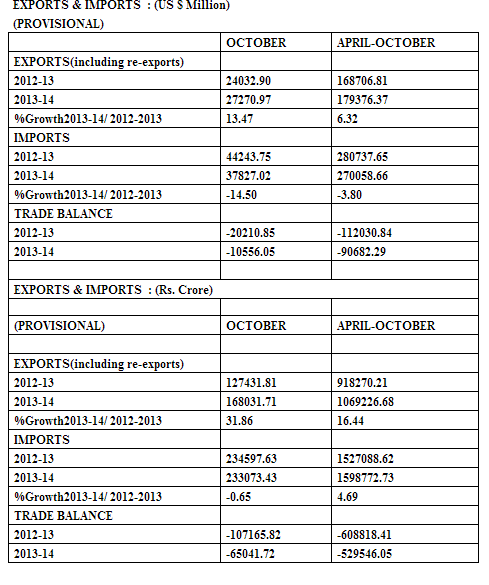 India's foreign trade data for October 2013 was released today. Trade balance as well as exports performance has been improving for the past couple of months. Exports during October 2013 stood at US $ 27.2 billion (Rs.168031.71 crore) which is 13.47 per cent higher in Dollar terms (31.86 per cent higher in Rupee terms) than the level of US $ 24 billion (Rs. 127431.81 crore) during October, 2012. Cumulative value of exports for the period April-October 2013-14 was US $ 179.3 billion (Rs 1069226.68 crore) as against US $ 168.7 billion (Rs 918270.21 crore) registering a growth of 6.32 per cent in Dollar terms and growth of 16.44 per cent in Rupee terms over the same period last year. Imports during October, 2013 were valued at US $ 37.8 billion (Rs.233073.43 crore) representing a negative growth of 14.50 per cent in Dollar terms and a negative growth of 0.65 per cent in Rupee terms over the level of imports valued at US $ 44.2 billion (Rs. 234597.63 crore) in October, 2012. Cumulative value of imports for the period April-October, 2013-14 was US $ 270 billion (Rs. 1598772.73 crore) as against US $ 280.7 billion (Rs. 1527088.62 crore) registering a negative growth of 3.80 per cent in Dollar terms and growth of 4.69 per cent in Rupee terms over the same period last year. So the general trend is that exports are increasing both in dollar and rupee terms and imports are decreasing, leading to better trade balance. Oil imports have not decreased. In fact, they increased by around 3% over last year (cumulative from April-Oct), but other imports (including Gold) have decreased over the period, by around 7 percentage points, leading to such favorable figures. Current account deficit looks comfortable for the time being.